With the growing interest in PVC cladding as a home improvement solution. Freefoam Building Products is pleased to announce the launch of two handy online tools to help make choosing cladding for your project easier and simpler, a cladding visualiser and a cladding calculator. 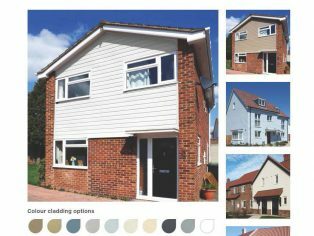 Recognising that the majority of home improvement product research is now carried out online Freefoam have introduced a clever tool to help specifiers, developers and homeowners visualise the Freefoam colour range of cladding products on a variety of house types. With the ability to also select matching or contrasting trims the tool gives users the opportunity to experiment with colour combinations and create a realistic visual representation. Having product quantities to price up a project can be extremely useful. The Freefoam cladding calculator gives customers the opportunity to generate an estimate of the number of boards and packs needed for a project. Simply type in dimensions in metres and the calculator works out the rest giving users a final quantity. The Freefoam cladding range features a choice of smooth woodgrain finish or Fortex® timber effect embossed boards in Shiplap, Double Shiplap and Weatherboard styles. Available in a wide variety of colours from traditional Mahogany and Rosewood to contemporary Anthracite Grey and Argyl Brown or subtle Misty Grey and Cappuccino. PVC-U cladding requires minimal maintenance once installed a major benefit for property owners and a compelling feature for any property developer or public sector housing provider. With significant environmental credentials, being awarded an A+ rating from the Building Research Establishment’s (BRE) ‘Green Guide To Specification’ when installed with standard components, the range makes a real alternative to timber and fibre cement products. To see for yourself click the following links: Cladding Visualiser and Cladding Calculator.